For good reason Wooden Table tops continue to be the most popular table tops being used in the Leisure Industry. The most popular are Solid Ash and Solid Oak. 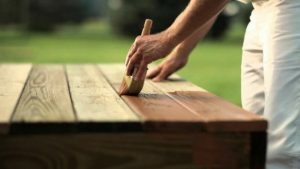 Although most woods can be used for table tops, the maintenance is still key. Pre-installation, the Table tops are usually finished to your wood stain. Included in this, the Wooden Table tops are coated in Lacquer which protects the surface as well as maintains the longevity of the Tops. For Cleaning we would recommend using Warm Soapy water. This would clean it sufficiently for the next use, without any harm on the Hygiene front. Alternatively, Contract Disinfectant can be used, and we would recommend using the specified amount on the Instructions. If used in excess over time, the disinfectant can break down the lacquer used on the table tops and this can then become sticky. – Bleaching or Warping from direct sunlight or by a consistently Hot radiator. – Hot pans or plates being put directly onto the surface. – Changes in Humidity or high heat can cause tables to warp or crack. – Incorrect disinfectant being used as stated above. These Wooden Table tops have been pre-treated with an External oil. However, with our unpredictable and Wet weather that we do experience, we do recommend regular maintenance with a light sand and coating with External Oil. Following the Manufactures instructions this is easy to do but without doing so can lead to splitting and bleaching. For more information contact the Manchester Showroom on 0161 832 8080.